Tasty and easy to prepare dinner. Boil rice and peas together in a saucepan. Salt can be added if desired. Heat a small amount of olive oil in a large frying pan and brown the chicken. Add a teaspoon of cajun spice to the chicken. Add the green pepper and cook until soft. A small amount of pepper can be added at this point. In a bowl, mix 5 tablespoons of the greek yoghurt, 1/2 tablespoon of cajun spice, a small amount of pepper and parsley. This can be adjusted to taste. Heat the pitta bread under the grill for a few minutes, until soft and slightly toasted. Peel the mango and cut into small segments. Take the chicken mix off the heat and add the mango segments. The greek yoghurt can be mixed through with the chicken, off the heat, or can be spooned into each pitta bread on top of the chicken mix. 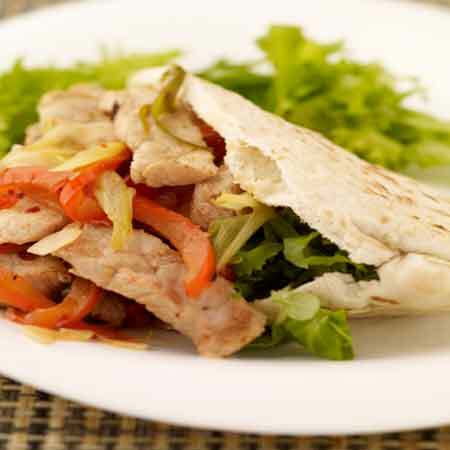 Cut the pitta breads open and spoon the chicken and veg mixture into the pockets, and add a sprinkle of cheese. Add 2 tablespoons of sweetcorn to the drained rice and peas.